American Greeting Card Co. in Cleveland, Ohio, was his neighbor. Pekar saw Crumb's work on Fritz the Cat and other early creations, and came to realize that comics could be more than just children's literature. Ten years later, Crumb was again in Cleveland, and Pekar, by then a published writer about jazz, was inspired to write a few stories for Crumb to illustrate. As subject matter, he chose the minutiae of his life as a hospital file clerk. It was another four years — 1976 — before he started gathering those stories together, and publishing them in a comic book titled American Splendor. Since then, a new issue of American Splendor has come out about once a year, and Crumb isn't the only artist to draw stories in them. Pekar's insightful observations about everyday blue-collar existence have attracted a virtual who's who of comix. Frank Stack (New Adventures of Jesus), Val Mayerik (the first to draw Howard the Duck), Paul Mavrides (a collaborator on The Fabulous Furry Freak Brothers), Don Simpson (Megaton Man) — these are only a few of Pekar's American Splendor collaborators. Keeping each issue in print, Pekar slowly built an audience for his work. It has been anthologized in paperback form, and was adapted into at least two stage plays (in one of which Dan Castellaneta, voice of Homer Simpson, played Pekar). In 1987, it brought him an American Book Award. It's been made into a film, which won the top dramatic award at the 2003 Sundance Film Festival and an International Critics' Prize at the same year's Cannes Film Festival. Also, America's National Society of Film Critics named it the best picture of 2003. By 1986, he'd become well enough known to appear on David Letterman's late-night TV show. Despite quarreling on the air with Letterman about the show's corporate masters, he was invited back repeatedly for the next two years, after which Letterman, apparently having had enough of the prickly writer, banished him from the show forever. (He has since been invited back.) 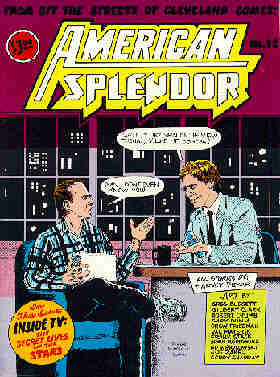 Predictably, Pekar's TV appearances have, themselves, become fodder for American Splendor stories. In the early 1990s, Pekar was diagnosed with lymphatic cancer — and that, too, became the subject of his writing. Our Cancer Year, written in collaboration with his wife, Joyce Brabner (herself a comics writer whose credits include Real War Stories and Activists), and drawn by Frank Stack (The New Adventures of Jesus), came out in 1994 and stands as Pekar's most ambitious work to date. Since the diagnosis, Pekar no longer publishes his own work — but he still writes. Recent issues of American Splendor have been published by Dark Horse Comics (Cadillacs & Dinosaurs, Flaming Carrot). In the 21st century, Pekar's work was finally embraced by one of the most mainstream comics publishers of all. Vertigo (Swamp Thing, Animal Man), an imprint of DC Comics, published its first issue of American Splendor in November, 2006. Pekar's critics accuse him of having founded the "dull autobiography" genre of comics writing. But as is often the case, his many imitators miss the point. It isn't Pekar's normal, work-a-day life that draws so many readers to his work. It's his ability to find piquant things to say about the ordinary things he sees and does. Pekar died in 2010, after 70 years of an ordinary life, made interesting only by his talent for describing it. Text ©2000-10 Donald D. Markstein. Art © Harvey Pekar.